The air corridor from the East to West coasts is one of the busiest in the United States. On a typical day, more than 100 flights make the six-hour journey between the Big Apple and Tinseltown. That’s thousands of hours per day that passengers are stuck in airless, soulless tubes with lousy Wi-Fi. And the experience is much worse when you realize that the technology exists to cut that time in half—but airlines are forbidden to use it. The main reason is noise. As soon a plane exceeds the speed of sound—about 767 miles per hour, depending on temperature and other conditions—it creates a thunderclap heard in all directions. In 1973, the Federal Aviation Administration (FAA) banned supersonic planes operating over the continental U.S. But NASA thinks it can finally solve the problem that’s dogged aerospace engineers for decades: lowering the sonic boom. In April, NASA signed a $247.5 million contract with Lockheed Martin to help develop a quiet supersonic plane, the X-59 QueSST. A “low-boom flight demonstrator,” the X-59 won’t carry passengers across the U.S.; it’s designed to prove to federal and international regulators that supersonic jets can create a sound no more disruptive than conventional passenger planes. If the project is successful, it could lead to a change in regulations and a new class of speedier jets. NASA already has a basic design for the plane, a slender shape that reduces its “acoustic signature.” In early November, it will test the concept over the skies of Galveston, Texas, sending a modified combat jet, the F/A-18 Hornet, into a series of dives that produce sonic booms similar to the X-59’s. NASA has recruited 500 people on the ground to answer surveys about the noise. “We’re solely focused on addressing the challenges of quiet supersonic flights over land, reducing that sonic boom to a sonic thump,” said Sasha Ellis, a NASA spokesperson for the X-59 mission. After gathering the data, NASA will share the information with Lockheed Martin, which is scheduled to start building the X-59 in January 2019. The goal is to have an X-59 ready for trials in 2021. Only after NASA shares sound data with the FAA can manufacturers begin crafting their own supersonic planes. 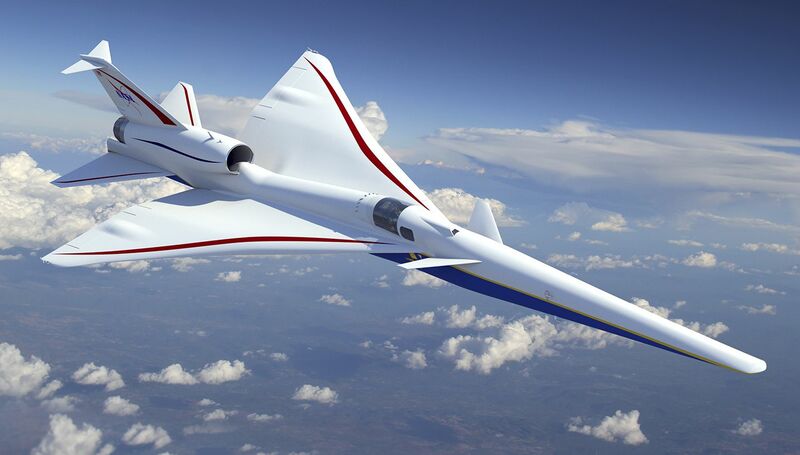 Peter Coen, NASA’s project manager for commercial supersonic technology, said sonic boom lessons from the X-59 can be scaled up to plane capacity as large as 100 passengers. NASA has taken some criticism for developing a technology that would likely add to carbon emissions, a contributor to global warming. Once NASA and Lockheed prove to regulators that supersonic jets can produce publicly tolerable noise levels, they plan to focus on environmental issues. Emissions and fuel efficiency are beyond the scope of the X-59 mission, said Peter Iosifidis, Lockheed Martin’s X-59 program manager. The likely beneficiaries of supersonic travel over land, at least at first, will be high-end corporate customers. “Such flights won’t be available for vacations to Disney World. It’s designed for road warriors who need to get to and return from places quickly,” said Vik Kachoria, president and CEO of Spike Aerospace, which is building a supersonic corporate jet for ocean routes. “As with most new products, the affluent are more likely to be the first adopters,” said Iosifidis. But once technology is taken up, prices often fall.